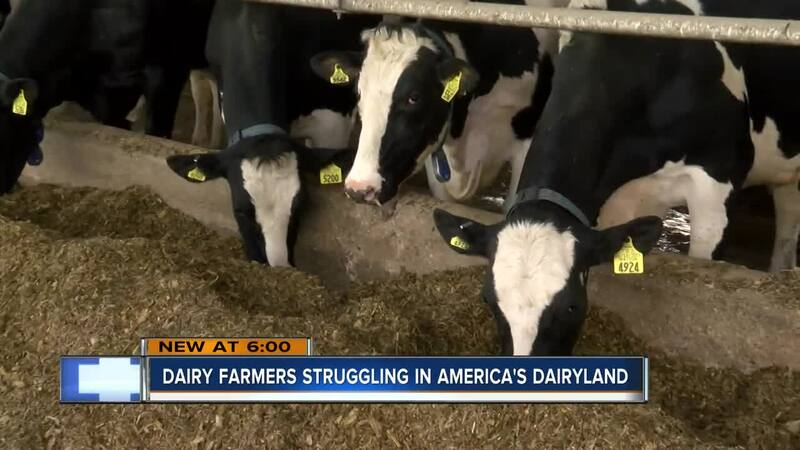 Wisconsin is known as 'America's Dairyland' but there is concern about the future of the dairy industry across the nation. "It does concern us because we have to make a living on the farm. We have to pay our bills. We have loans. We have to make sure we get paid. We have tried to cut expenses as much as we can," said Dave Daniels, Co-Owner of Mighty Grand Dairy Farm. For Dave and Chad Daniels, farming is not only their passion, it's also their way of life. "We don’t look at this as a job we look at it as a livelihood this is what we are born and raised to do," Chad Daniels said. Their farm has 550 cows with their milk going to a cheese maker near Fond du Lac. Since the price of milk has consistently declined since 2014, they said their income from sales has gone down 35-40% but it's not only their farm suffering with losses, farmers across the state and nation had the same issue. The dairy industry contributes $43 billion to Wisconsin's economy annually. Mark Stephenson, Director of Dairy Policy Analysis at the University of Wisconsin, said not all the farms closing down is specifically due to financial issues, others were at an age where they were ready to retire from the business. Stephenson said prices in the industry fluctuate but this is the fifth consecutive year milk prices are low. "There has been a lot of production put on the world market place made available. We have had too many stocks on dairy products. All those things put downward pressure on prices," Stephenson said. "I think there is a possibility by the time we get to the fourth quarter this year, that we could have potentially much better prices," Stephenson said. "Farmers are pretty resilient. It’s springtime so we are ambitious and we would like to see things changed around," Dave said.